Part 21 of Wonders of World Engineering was published on Tuesday 20th July 1937, price 7d. Part 21 includes a colour plate showing An Aircraft Engine Being Tested at the Royal Aircraft Establishment. It formed part of the article on Aircraft Engines. The colour plate was previously used as the cover design for part 18. 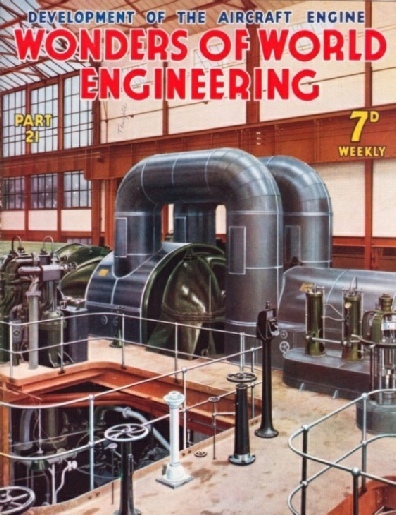 The cover of this week’s part shows the interior of the turbine house of the Metropolitan Borough of Hackney (London) Electricity Works. 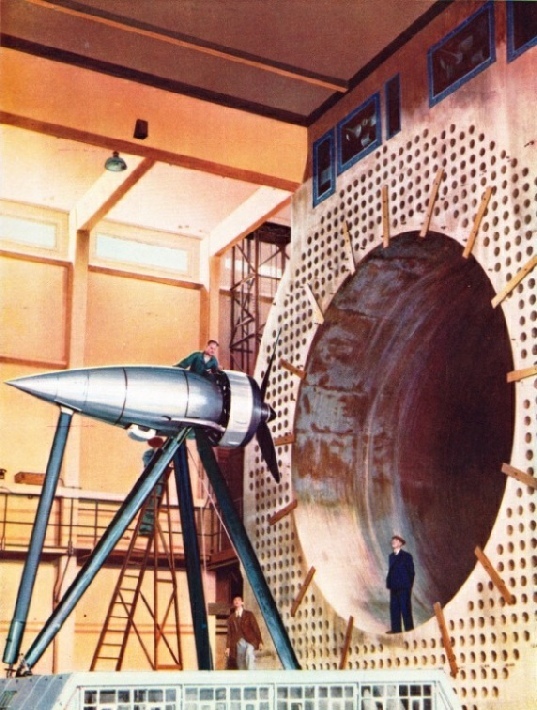 The subject is a 30,000-kilowatts turbine which was installed in 1932. At a speed of 3,0000 revolutions a minute, the turbine generates about 40,000 horse-power. This cover illustration was later reproduced as the colour plate in Part 50. The story of the building of the Severn Tunnel, concluded from part 20. This is the fifth article in the series Below the Surface. You can read more on the Severn Tunnel in Railway Wonders of the World. The numerous forms and types of glass are produced by a specialized and often spectacular process from a common basis of sand fused with an alkaline flux and a metallic oxide. Some of the machinery used is remarkably ingenious. This chapter is by F E Dean and describes the various processes involved in the manufacture of glass. Glass-making has been carried out for more than three thousand years, and in Great Britain since the Roman occupation. The glass industry to-day affords one of the most interesting and spectacular displays that can be seen. Rivers of molten glass slowly change into streams of gleaming crystal and from tanks of the molten material great cylinders of shining glass rise majestically to as high as 50 feet above the ground. Two engineers who are famous for other achievements did much to improve glass furnaces. These men were Sir Henry Bessemer and the Hon. Charles A. Parsons. Temperatures up to 1,400 degrees centigrade are involved and special instruments known as pyrometers are used to measure the exact temperature to which the material must be heated This is the fourth article in the series on the Romance of Industry. The remarkable interior of the vast Australian continent is even yet to a considerable extent undeveloped. In the wake of explorers, however, engineers have laid a north-south telegraph line and an east-west transcontinental railway. This chapter is concluded in part 22. 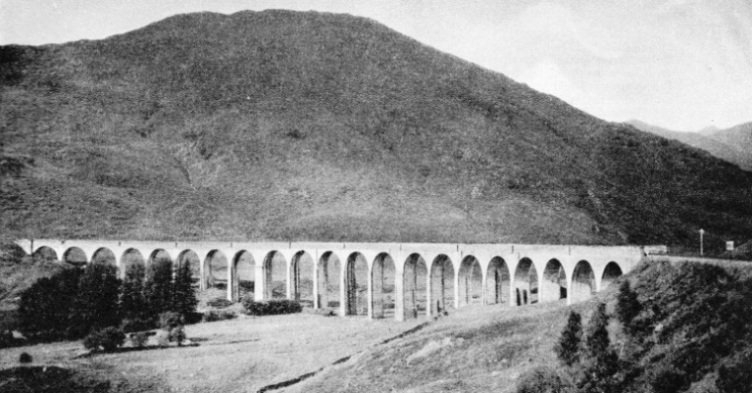 GLENFINNAN VIADUCT carries the Mallaig extension of the West Highland Railway (LNER) across Glen Finnan. Built of concrete throughout, the viaduct is 416 yards long and is formed by twenty-one spans of 50 feet. The maximum height is 100 feet. The viaduct is built on a curve with a radius of twelve chains. All but two of the piers are 20 feet long and 6 feet thick at the top. the harvesting machine is attached directly to a tractor which has the same degree of mobility as the horse. The tractor illustrated below will do the work of eight to twelve horses, according to the nature of the ground, the “rated” drawbar pull being 13.5 horse-power. pump are driven from the camshaft. The fan, which keeps the radiator cool, is driven by a belt from the crankshaft. hour and a single speed of 2½ miles an hour in reverse. The changes are made by appropriate movements of a single lever by the driver. The shaft seen above the first motion shaft is one that does not exist in a motor car and has two purposes. 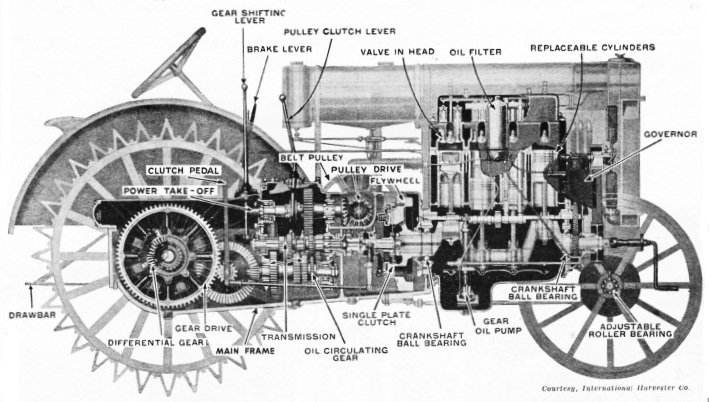 It is driven from the gearbox and at the forward end, drives, through bevel gears, a pulley at the side of the tractor. This pulley runs at a speed of 645 revolutions a minute and can be used, with the tractor stationary, to drive a chaff cutter, turnip cutter or any other farm machine, by means of a belt. The “rated” power obtainable from the tractor when using the belt drive is 21.6 horse-power. Another form of drive can be obtained from the auxiliary shaft, as this can be prolonged from the point marked “power take off” in the illustration, by a shaft running out at the back of the main frame at the point closed in by a small domed cover. This shaft rotates at a speed of 543 revolutions a minute and is used for operating tractor-drawn and tractor-mounted machines with power transmitted direct from the tractor engine. The rear direct drive or the pulley drive is engaged as required by a clutch lever. This is the twelfth article in the series on Modern Engineering Practice. Many beautiful and well-designed viaducts and bridges span the lochs, rivers and valley which confronted the men who built roads and railways through the Scottish Highlands. 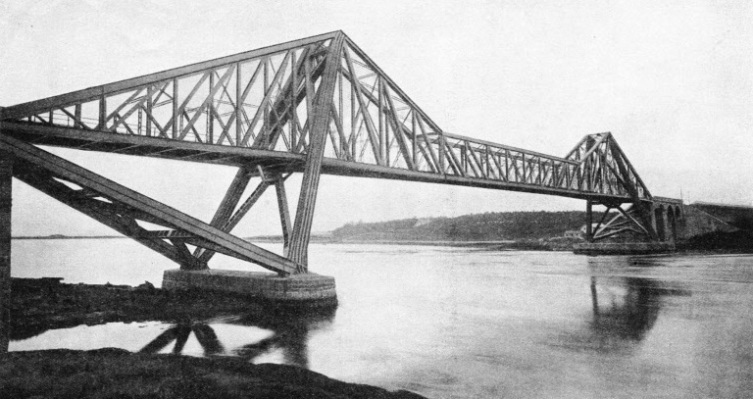 The largest bridges in Scotland are those which span the Firths of Forth and Tay, but all over Scotland with its mountains and valleys and rivers, lakes and sea lochs, there are road and railway bridges of outstanding interest. In this chapter C Hamilton Ellis describes many of the important bridges in the Scottish Highlands. General Wade, the great Thomas Telford and Rennie in the eighteenth and early nineteenth centuries were responsible for many bridges which are still in use to-day. Of the more recent structures the Glenfinnan Viaduct and the Connel Ferry Bridge are outstanding examples of how the engineers have been able to span waterways and valleys to carry the railway and the road through mountain fastnesses. This is the eighth article in the series Linking the World’s Highways. THE NIEDERFINOW BARGE LIFT, on the Hohenzollern canal, Germany, is controlled by electricity. Mounted over the trough are two control rooms, one at either end. From here the speed of the lifting motors is controlled and the trough brought to rest at the correct level. The vertical speed is 4 inches a second. THE ANNEALING OR TEMPERING PROCESS in the manufacture of glass is carried out in machines know as lehrs. A modern lehr comprises a heated tunnel through which glassware is passed on an endless metal belt driven by an electric motor. The lehr illustrated comprises sections with varying degrees of insulation in which the glass is gradually annealed and cooled. 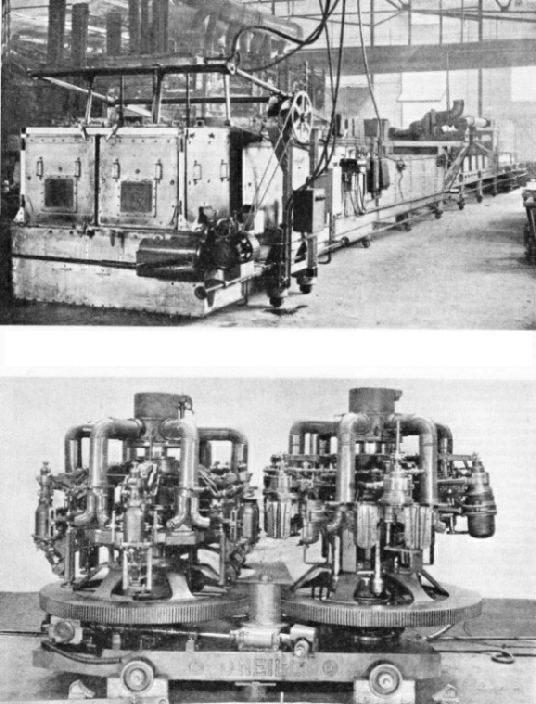 ELECTRICALLY OPERATED BOTTLE-MAKING MACHINE, comprising two turntables geared together, each carrying six moulds. This machine takes molten glass directly from the furnaces into the moulds. Compressed air blows the bottles, once with the bottle inverted on on turntable and once with the neck upwards on the other turntable. A SHEET OF MOLTEN GLASS emerging from the roller. 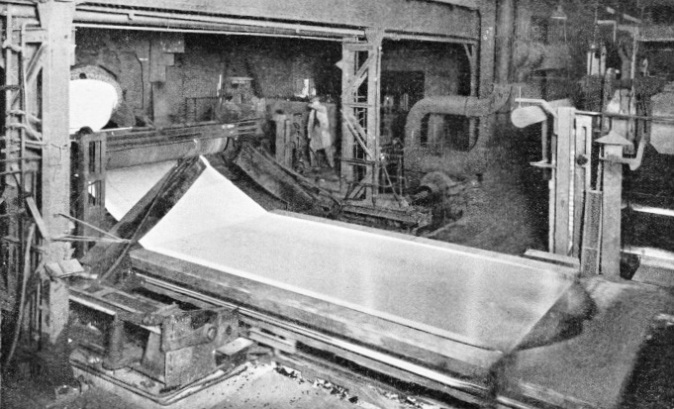 In the manufacture of plate glass the molten material is poured on to a table and squeezed flat by a heavy roller with a diameter of about 30 in. Guillotines cut the sheet into suitable lengths which then pass into a lehr for the annealing process. Annealing is necessary because glass, on leaving the furnace, is in a state of tension. Developed from the motor car engine of thirty years ago, the aircraft engine of to-day is a miracle of efficiency and compactness. For high-powered engines the water-cooled “V” type is rivalled by the air-cooled radial type; for smaller engines the air-cooled “in line” arrangement is popular. This chapter is by Grenville G O Manton and describes the evolution of the aircraft engine over more than thirty years. One of the most ingenious aircraft engines ever built was the “Gnome”, a rotary engine invented by M. Laurent Sequin. Rotary engines played an important part in the development of pioneer flying. To-day, for high-powered engines, the water-cooled “V” type and the air-cooled radial type are outstanding; for smaller engines the air-cooled “in line” arrangement is much used. In addition, compression-ignition engines are coming to the fore. 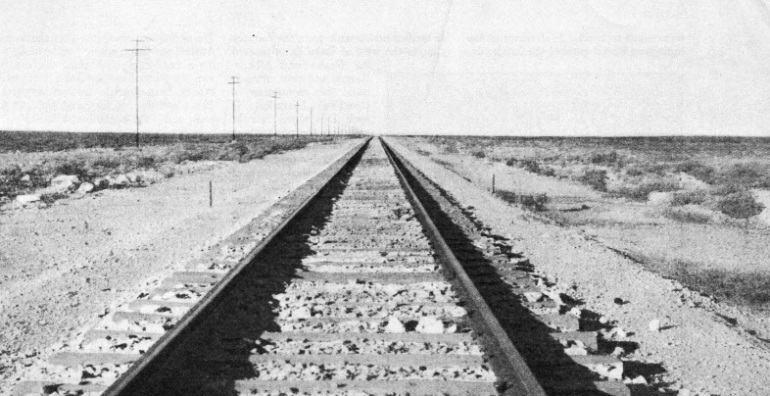 ACROSS THE NULLARBOR PLAIN, the Plain of No Trees, the Australian Transcontinental Railway has one stretch of 300 miles without a curve. Lack of water was a serious handicap for the builders of the line. Along the route of 1,051 miles the railway did not cross a single permanent stream of running water. 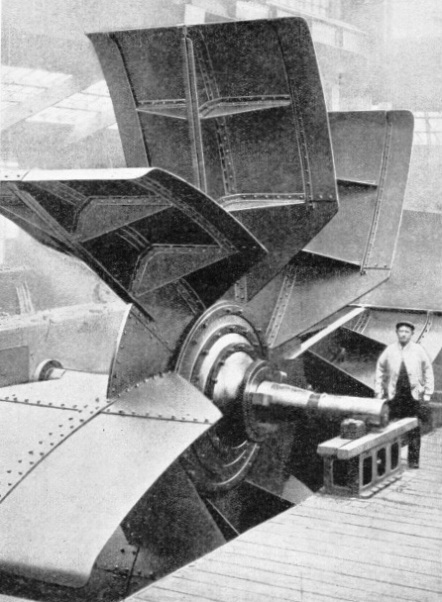 THE ENORMOUS VENTILATING FAN which supplies air to the Severn Tunnel. Installed in 1924, the fan has a capacity of 800,000 cubic feet a a minute. The fan is 9 feet wide and has a diameter of 27 feet. CONNEL FERRY BRIDGE has a clear span of 500 feet across the entrance to Loch Etive from the Firth of Lorne. The two main piers which support the great cantilevers are 524 feet apart from centre to centre. The peculiar arrangement of the cantilevers gives an impression of two huge triangles, each with an apex resting on a pier in the water. 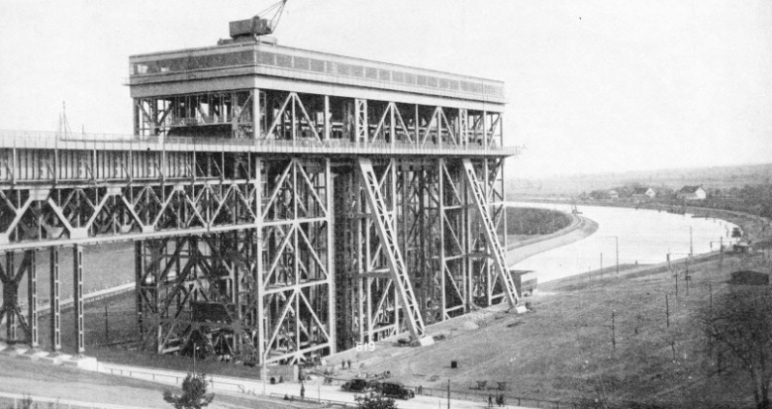 German engineers in 1934 completed a unique feat of engineering when the Niederfinow Barge Lift, on the Hohenzollern Canal, raised for the first time barges weighing 1,000 tons a vertical distance of 116 feet. As builders of canals the Germans have always held an enviable reputation, but they have exceeded their previous feats with the building of a special lift which raises barges weighing as much as 1,000 tons through a vertical distance of 116 feet. 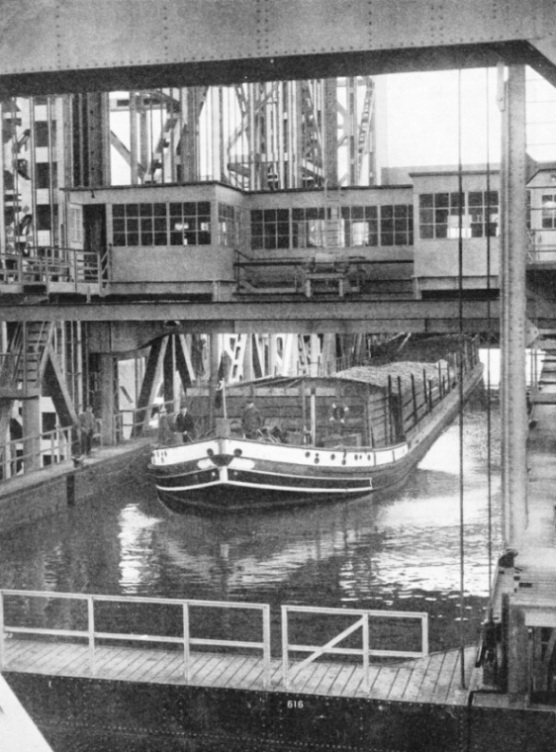 This famous barge lift on the Hohenzollern Canal is described by A P Luscombe Whyte. Work started on the scheme in 1926, and eight years later the Niederfinow Barge Lift was opened. The lift, it was estimated, would weigh more than 20,000 tons, and to take this weight the engineers were faced with building extremely solid and immovable foundations. The site was excavated and thousands of piles were sunk. On them was built a vast concrete raft reinforced with steel. This raft consisted of a solid block of concrete 367 feet long, 108 feet wide and 26 feet thick. It was one of the biggest masses of concrete ever poured. The enormous trough which carries the barges weighs about 4,200 tons, yet no great lifting power is needed to raise this tremendous weight because of an extensive and carefully balanced system of counterweights. A particularly interesting feature of this lift is the electric installation which controls the raising and lowering of this huge trough. A TOWERING STRUCTURE OF STEEL, nearly 200 feet high, 308 feet long and 88 feet wide, contains the trough in which barges weighing up to 1,000 tons are raised from the lower level of the Hohenzollern Canal. A huge aqueduct joins the upper section of the canal to the lift. THE ROLLS-ROYCE KESTREL has twelve water-cooled cylinders arranged in two banks of six at an angle of 60°. Each block carries a camshaft driven by bevel gears to operate the overhead valves. The engine, which may be either supercharged or unsupercharged, is made in various forms to suit specific requirements. With a swept volume of 21 litres, the “Kestrel”, in unsupercharged form, develops 570-625 horse-power and weighs 900 lb. The normal speed is 2,500 revolutions a minute; the propeller is geared down by a special type of reduction gear. A NEW HEIGHT RECORD of 49,944 feet was made on September 28, 1936, by Squadron Leader F R D Swain, flying a monoplane fitted with a Bristol “Pegasus” engine, of the type illustrated. 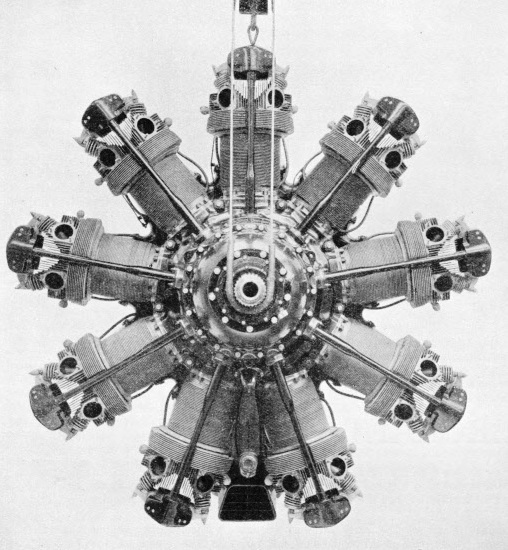 This is a radial engine with nine air-cooled cylinders having a total capacity of 28.7 litres and weighing 1,010 lb. The normal rated brake horse-power is 740 at 3,500 feet and the normal speed is 2,475 revolutions a minute. A reduction gear is fitted to lower the airscrew speed. Click on the icon to see a British Pathé newsreel clip of Squadron Leader Swain describing his record-breaking flight. AN AIRCRAFT ENGINE BEING TESTED at the Royal Aircraft Establishment, Farnborough, Hants. The engine is set on a frame in front of an enormous wind tunnel specially designed for the testing of aircraft equipment. The tunnel is built of steel and reinforced concrete and is capable of dealing with aircraft having a span of up to 56 feet. Air is driven through the tunnel by a fan with a diameter of 30 feet. This colour plate previously appeared as the cover design for part 18. 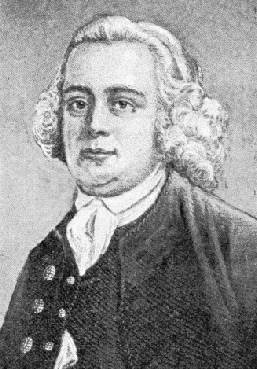 Although he could write only with difficulty because of his lack of education, James Brindley was a man of genius in mechanical affairs. To him Great Britain owed the complex system of canals which contributed so much to the growth of industry. The term millwright, though now almost obsolete, denotes one who, in the early days of engineering, was the only practical engineer. With nothing but hardly-won experience to guide him, he had to take a turn now at the forge, now at the foot lathe, now at the carpenter’s bench. Such work would not be held to-clay as qualifying a man to practise as a civil engineer, certainly not to undertake work which had not been attempted before in Great Britain. Yet, it was to a millwright, James Brindley, that England really owed that system of canals which, before the coming of the railway, did so much to make her a great industrial nation. James Brindley, born in 1716 at, Thornsett, Derbyshire, started life with no material advantages. Neglected by his father, who mismanaged a small farm, the boy grew up barely able to write or to work the simplest sums, and gained a poor livelihood as a farm labourer until he was seventeen. At that age Brindley, on his own initiative, became apprentice to a local millwright and at first it seemed as though he would be a failure in his chosen trade. His fellow workmen would teach him nothing and, when his industry and genius showed he was likely to outstrip them, they were openly jealous. His master even reproached him for making too good a job of his work, on the ground that this interfered with profitable repairs. as a millwright, having reached the age of twenty-six. which chamber was placed a waterwheel driving the dewatering pumps. The tunnel tapped the waters of the River Irwell and a tailrace led the spent water back to the river at a lower level. The installation was wholly successful. This untaught man anticipated, by a century and a half and in principle at least, a scheme put into operation not long ago at Niagara Falls. Brindley had found a still more engrossing occupation, for he had been engaged, early in 1758, in surveying the route for a canal or, as it is entered in his notebook, “surveying the novogation”. This illiterate entry, typical as it is, does less than justice to Brindley. His great mind could, without the help of drawings or extensive notes, visualize a complex scheme in all its details and with all its attendant calculations. The canal was built for the Duke of Bridgewater, from Worsley (Lancs) to Manchester, and it was designed to cross the River Irwell at Barton. Carrying a canal across a river was in those days considered a fantastic notion and the plan excited much derision. Yet the canal and the aqueduct were built. Finished in 1761, it remained in use for over 130 years, when that part of the River Irwell became part of the Manchester Ship Canal and Brindley’s work made room for the swinging aqueduct described on page 322.
canals were built by Brindley, who was responsible for nearly 400 miles in all. with their locks, extensive tunnels, aqueducts and embankments. The full story of Brindley’s work is amazing considering the appliances of his day and it illustrates well the great driving force of single-minded purpose even when its possessor is handicapped throughout life by what our pedagogic generation would call lack of education. On September 30, 1772, Brindley died in harness, for it is recorded that even on his deathbed he was appealed to for advice on canal construction. This is the eighth article in the series on Makers of Engineering History.